For those of you who don’t know the banana boys, here’s a bit of a history lesson for you – until the mid 1990′s the local Durban rugby team was known as the “Banana Boys” before the rebranding to “The Sharks” as they are known today. Then there were also the banana boys who sidelined and supported the team by carrying their surfboards and doing multiple pushups as the team scored more points. These banana cupcakes were one of the favourites from all the baking last week. 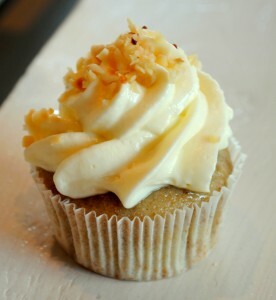 The moist banana base is not too sweet and compliments the lemon cream cheese icing. After living in Germany for almost 3 years, I have come to learn that the Germans like fruit in their cakes – variations from peach to cherry and strawberry. In South Africa we are used to fresh baked banana bread with a cup of rooibos tea and while perhaps the banana taste was a bit unfamiliar to some, it was difficult to stop at just one cupcake. After eating a few of these cupcakes, I think more than a handful of pushups will be needed to burn off the calories.